How Much Do Granite Countertops Cost in Arlington, TX? How Much Do Quartz Countertops Cost in Arlington, TX? Granite Countertops Can Endow Any Kitchen with Natural Beauty. Granite countertops represent a very popular choice for the improvement of a home’s bathroom or kitchen. For a extensive variety of choices in granite countertops, from polished to rustic, Wholesale Granite Direct stands as an excellent place for service and sales. Granite is dissimilar from quartz countertops, laminate, or tile, in that it is a completely natural product. 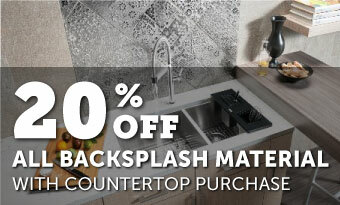 This means that granite countertops consistently are a totally individual product. Even though people generally go for granite due to its appearance, it also has further advantages. Adequately maintained granite countertops will persist for many years. Granite’s two primary drawbacks, porousness and susceptibility to stains, are freely counteracted with sealant. In excess of 100 kinds of granite exist in various hues, styles, and price points. Contact our company at 817-962-2616 when you require help with your pick. For superb granite countertops in Richardson, TX, you may always count on the masters at Wholesale Granite Direct. 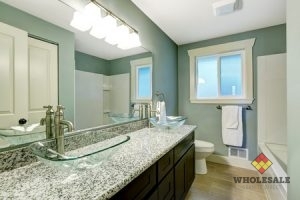 Granite and Quartz Also Work Wonders When Installed in a Bathroom. Most people consider quartz, which goes through a man-made process, a natural stone for its employment as a countertop. Quartz and granite do possess identifiable differences, their related price point and appearance aside. Quartz has improved durability when considered next to granite, and also isn’t porous. Quartz generally gets chosen for bathrooms, due to its lack of porousness. A large selection of colors and styles represents quartz’s benefit from the manufacturing procedure. We maintain a massive variety of quartz and granite countertops. If you need any assistance with your choice, our professional staff is always happy to help. Our Granite, Bathroom, and Kitchen Visualizer allows you to have a head-start on the whole process. If you want to browse options firsthand, you can additionally visit our showroom and warehouse. We maintain the largest selection between granite and quartz countertops in Richardson, TX, and are happy to serve your needs. Granite Countertop Should you desire a kitchen unique to your home, choose granite. Quartz Countertop Though not totally natural, quartz is non-porous and is somewhat more durable than granite. In addition to granite and quartz, we sell and install additional types of stone countertops. We supply slate, soapstone, marble, and an assortment of other stone. If you need something really unique, we also supply an uncommon and superb assortment of choices with our specialty stone countertops. We also supply stunning Euro style countertops, which create a singular statement when installed in the right space. Natural Stone We have a further range of natural stone selections that includes slate and marble. Specialty Stone These include uncommon and unusual cuts and varieties of quartz or granite, in addition to other exotic stones. Euro Style Also known as waterfall countertops, Euro style installations let you really emphasize your superb stone countertops. When most individuals consider natural stone in the residence, they only consider granite and quartz countertops. Our installation services actually take care of a large selection of residential elements. Whatever the particular room, we will install natural stone touches throughout the house. No kitchen feels actualized without backsplashes, and natural stone showers bring a lot of appeal into bathrooms. As for other places around the residence, we provide granite remnants perfect for employment as accent pieces. Backsplashes Our stone and tile backsplashes supply the ideal finishing element for a room. Showers For exceptional luxury, think about a shower remodel from our crew. Sinks Our assortment of sinks runs the gamut from stone to steel. Remnants Our selection of granite remnants provides excellent material for accent pieces and small tables. Different edge profiles act as an adornment for your granite or quartz countertops. The profile you pick can bring a great impact, especially with bolder types of granite countertops. We possess a full selection of edge profiles that includes both upgraded and complimentary selections, so that everyone can make a decision that suits their unique style. Bevel Ideal for traditional decor, the bevel edge supplies a heavy appearance. Demi Bullnose The classy style of the demi bullnose renders it one of our more chosen edges. Full Bullnose The rounded edges of the full bullnose endow a countertop with elegance. Laminate Laminate edges represent additional stone glued to the underside of your edges. Ogee Ogee edges seem especially nice on kitchen islands. Straight A straight edge achieves a clean, sleek, and modern style. When it comes to granite or quartz countertops in Richardson, TX, only Wholesale Granite Direct provides both quality service and exceptional pricing. We remain prepared at 817-962-2616 to address any questions or schedule an opportunity for service. Wholesale Granite Direct has incredible prices on granite, quartz, and other natural stone countertops. Visit our team soon to make your home dreams a reality. Updated on March 29, 2019 at 3:02 pm by Wholesale Granite Direct.